husband's gun would be the best way. doctor replied, "Just below your left breast". All ended well, however, as the woman recovered nicely after the surgical repair to her knee. The moral to the story is, you too may well have a sagging problem that you are not aware of. I'm talking about the springs on your Lotus, which, as on all light cars, can end up settling on the driver's side over the years. So as you can see, my car was ½ inch lower on the driver's side than the passenger side. 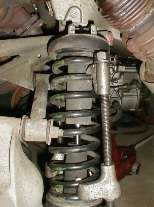 Time to do something about that: swap the spring/shock assemblies side to side. the load). 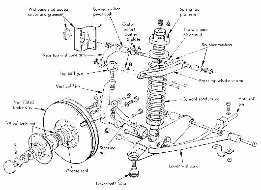 Then I put the jack stands under the jacking points behind the wheels, and lowered the car until the stand just steadied the body. Armor-All on the hardware makes a great penetrating oil. to aid in re-aligning everything on assembly. pulling on the rubber brake line. 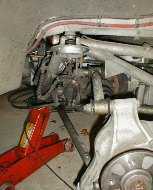 While pushing down on the lower control arm, pry up and outward on the lower shock mount, to move it from its hole. Then, you can remove the last nut on the upper spring platform and withdraw the spring/damper assembly. on its wheels, at normal ride height. remove the jacks and stands, and move to the back. a lot of energy and can cause injury if the hooks slip. Place the hooks with care! Since the safest position is on opposite sides of the spring, you must allow for the movement of the threaded bolt, as the spring becomes shorter. I found the best positions to be A) near the upper link, and B) opposite that, near the rear of the spring. On the left side, it is easiest to remove the stainless steel heat shield; the fiberglass cover over the damper post must also be removed. Loosen the lower shock nut (19mm), then the fun begins. the ¼ inch wrench and loosening the 17mm nut. If the small wrench has insufficient purchase, use the vice-grips to hold it, but be careful of damaging it. 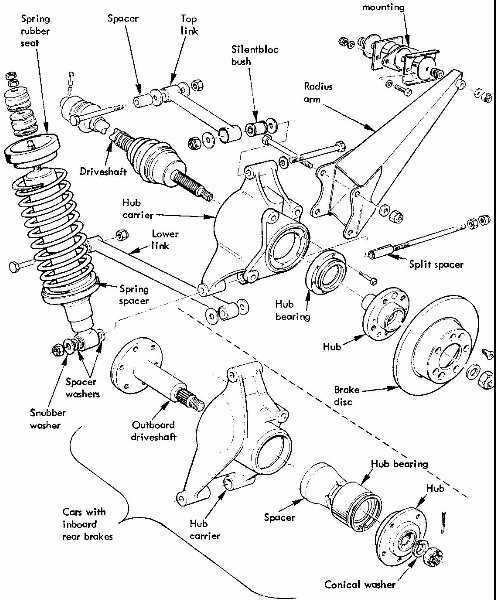 Once the upper bushing has been removed from the shock you can carefully remove the lower bolt and remove the spring/shock assembly. 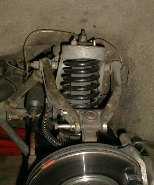 raise the lower hub until the spring starts to support the car, then tighten. 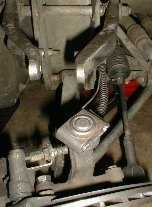 the front and rear shock nuts and the front lower wishbones. Final torque should be 50 foot-lbs. Take a short ride to assure that there are no undo noises from loose bushings, etc. you will find they can be brought tighter. That will do for another fourteen years!